Skipping rope is a great aerobic exercise, it creates an effect on the whole body. It reduces weight and helps to tone the arm and calf muscles. Jumping rope regularly reduces the rate of bone decay while you age. © Shutterstock. Experts believe that jumping with a rope reduces the risk of osteoporosis. According to research done by the UK’s Osteoporosis Society, jumping rope regularly reduces the rate of bone decay while you age, thereby reducing the risk of disease like osteoporosis. 10 minutes of skipping gets the same benefit as 30 minutes of jogging, 15 minutes of running and swimming for 12 minutes. Why skipping rope workout is beneficial? Skipping rope is a great aerobic exercise, it creates an effect on the whole body. It reduces weight and helps to tone the arm and calf muscles. Jump the rope regularly, the bones are strong and concentration and stamina also grow. Not only this, but it also helps in keeping our heart healthy. 1. Skipping increases metabolism and bone density, it is helpful to strengthen legs, knees and ankles. 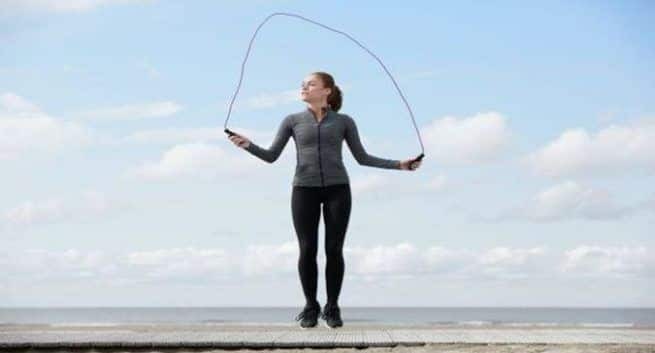 Regular skipping causes co-ordination between eyes, arms and legs to increase, but it is a short-frequency exercise that means it should be done for a maximum of 20 minutes. Due to continuous skipping, you may have excessive pressure on your lower body, increasing the risk of knee injuries. 2. Instead of skipping it, it should be included in your workout plan to take advantage of it. The body can be tone-up to the body with the exercise of the whole body. 3. In the beginning, jump one minute rope and then rest for 30 seconds. Do this 4 times i.e. for six minutes and then relax for two to three minutes. This way skipping is the heartbeat balance and calories burn too. 4. Jumping rope is a game. To do this, it is necessary to coordinate between hands and feet. This requires tuning between your arms and legs. If you are skipping the rope for the first time, it will take some time for you to learn. 5. Skipping should be done on a padded surface such as yoga mat etc. Speaking at concrete, hard or rigid places makes unnecessary emphasis on the gents. 6. Like other exercises, it is important to warm up and stretching out before starting the skipping. Also stay on the claws while skipping. Some people jump very high from the ground while skipping, which is wrong. This way, jumping rope quickly causes fatigue and there is a danger of injury. You should not jump over an inch higher than the ground. 7. It is very important to be fully fit for skipping. Do not skip when there is a knee injury, back pain, muscle bridges or any other kind of physical problem. 8. If you are bored by jumping the rope in the same way then you can make it interesting by bringing variety in the pattern. For this, you can try double-foot hoops, single-foot hoops, criss-cross, etc. You can also read this in Hindi. How to motivate yourself to workout during the festive season?